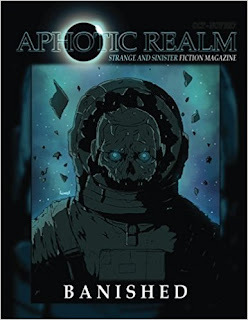 To celebrate the launch of Aphotic Realms second issue; Banished I 'm talking to Jonathan Boon one of the many uber talented authors featured in this magazine. 1) Tell me Jonathan, who are your favourite authors? My all time favourite author is Stephin King, I love how diverse and unique his stories can be. I am also a huge fan of Edgar Allen Poe, HP Lovecraft and Junji Ito. True titans of the horror industry. 2) What draws you to horror? Can you remember the first horror book/film you saw? The first horror film I saw was Child's Play, I caught my parents watching it when I was about 7 or 8 when I came downstairs for some water. I pleaded with my mother to allow me to watch some of it and it really scared me! The next night I went to bed my mum had put a doll very similar to Chucky (buddy) in my bed which gave me quite a scare. I think perhaps what drew me to watching something scary from a young age was perceived maturity which comes with horror, I felt grown-up when I was allowed to watch something scary and it gave me a unique connection to my mum. As for the first horror book I read, discounting from Goosebumps, I would say Richard Laymon's Beast House- a book that I couldn't understand from that age but I did love the way it was written, which got me interested in the craft. I am working on a new short story at the moment about a fisherman who discovers a head bobbing in the ocean, unable to leave it there as his wife was lost at sea he brings the head on board with plans to notify the police once he arrives back at shore. The head is left in a sort of Keep-box and at night he has nightmares about it after he hears bumping against the sides of the metal box. There is a lot more to this story but I don't want to give anything else away! 4) It says in your author bio that you're an urban explorer. Have you any experiences like Daniella of being lost and alone in the dark? I love urban exploring, I found an abandoned house near my apartment and in the house there are lots of framed documents stating what a pillar of society the former inhabitant was and how he helped the community, yet somehow his house is in ruins. I live in Japan and the house is not too dissimilar to the one feature din Ju-On (The Grudge). Upstairs there is a trail of 1 yen coins leading to a cupboard, it's very ominous and unnvering to be in there! There is also a Japanese doll is a sealed box! It's very odd and I have taken many photos in there if anyone wants to see them! I haven't personally had an experience like Daniella in 'Drained' but I am always imagining what something like that would be like. The sewers in Japan are huge and I've been down some in Nagoya but thankfully no one got stuck or lost. I drew influence from how alien the urban exploration places felt in this country and wanted to replicate that for Daniella in my story. Sorry love. Jonathan Boon is an English teacher who lives in Japan. He has a BA in Japanese studies. He is known for writing horror stories. Jonathan's short story was Mr Ellington is a Create50 volume 2 finalist. Jonathan is originally from Yeovil in the UK. His hobbies are boxing and urban exploration.